The Sumbot comes with a new visual style. It is fully hand-drawn from the wrist of our artist (well actually it's me, this is my first blog entry, so yeah enjoy). Remember the times of you sitting in class sketching something? It doesn't matter if it was a piece of art or just some silly scribbling. You gave in to the inner urge of getting something out of your mind and onto paper! It is as easy as grabbing a pen and letting yourself go. Sam is not a high-end game, it is super simple. A creation of the mind, drawn on paper. So the overall apppearance comes with a unique set of graphics because no hand-drawn thing is identical to another. OK, so what can we see? As mentioned in our earlier blog entry the goal is to catch the figures to get to the sum of (in this case) twenty-one. The equation on top helps your memory in this important endeavour. Watch out, you have only five spots to fill with figures to get to the sum! And by the way it will get harder, so don't worry. Each of the figures from zero to nine not only possess different shapes but also different colours. This makes it easily distinguishable. But what you see is not all. Different levels will await you this time around. Christmas time is a busy time. More busy than I expected (which in retrospective is kind of stupid thinking). With the Christmas Special of Fairy King there was just not enough time to work an our new project. So why am I writing if we can't publish an update on our progress? What we can announce is the switch of the designer. Our marketing expert, who did the graphics until now, will go back to her field of expertise (guess what: Marketing) and also helps out in developing some nice code. Our designer, who was responsible for the design of Fairy King is joining the team and will deliver some awesome graphics, I'm sure of it. So, why is this substitution a good thing? Bea, our marketing expert, did a great job in bringing our name into the world. She wasn't afraid of the big names in the media jungle and engaged the most read daily newspaper of Switzerland (and I think several hundreds of other newspapers^^). With success. We were featured on page 7 of the infamous 20 Minuten. The last few days we were engaged by people who saw us in the newspaper. The feedback they gave was amazing. Of course there are also some trolls who envy everyone who receives a little bit of attention, but who cares about them? It also boosted the download numbers and revenues. We are still far from getting rich, but we can afford at least some Kebab, which is nice. What's in for me reading this devblog entry? You have read until here. So what is point of this story? The message I want to bring to my fellow gamedevs is: Don't be afraid of the press. Go out, find a journalist and get an interview. Don't give up if they don't answer and keep going. Try, try, try! Eventually you find someone who is interested in your story. I hope I can deliver some updates on the progress of Sam, the Sumbot in the next few weeks. Until then stay tuned and follow us on Facebook and Twitter! Welcome to our gamedev journal of our newest title, "Sam, the Sumbot". We start with an introduction of the concept and the tools we use. So let's have a look at the following concept art. 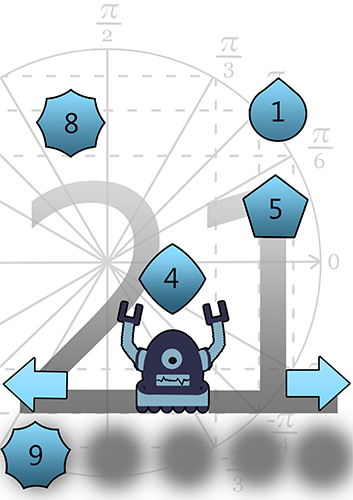 You help Sam, the cute little math robot catch the falling numbers. The control is quite easy,You can tap on the left or the right sight of the screen to move the bot. The numbers are falling down on tracks (5 at the moment) in a Tetris-like style. The bot jumps from track to track and catches to falling numbers. This catched numbers are added to a subtotal which you have to calculate by yourself. As a help the catched numbers are shown in the slots at the bottom of the screen. There is also the number 0, which obviously occupies a slot without adding to the sum. The total sum you have to get is shown as large number in the background. You receive more points, the less numbers you used to get the sum. A new random number will appear in the background. If you catch more than 5 numbers or overshoot the sum, you loose the game. 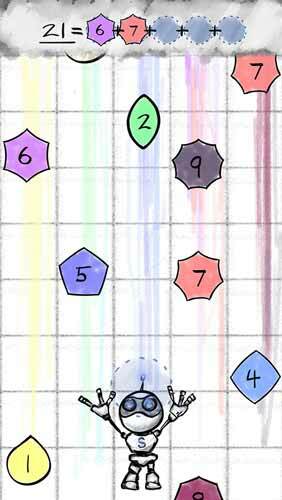 The idea behind this game is to combine mental arithmetics with reaction and skill. You are under a lot of pressure while keeping track of the subtotal, evading the numbers which you don't need and of course, catching the right ones. So far so good. Let's go to the more techical stuff. To develop this game, we use the so called Fairy Framework we have written for our first mobile game, Fairy King. This framework was written for Unity3D. We put a lot of effort into writing the code so that it is recycable. All the things like UI, splashscreen, ad integration, leaderboard, level design, spawn mechanism, collisions and lifetime management are reusable (I'm pretty proud of my spawning mechanism, perhaps I will write a tutorial about it in the future). But of course we didn't invent all from scratch, so we want to point out the plugins we use and share the experiences we made integrating them. Admob Plugin - This is a really cool plugin which helps integrating ads on Android and iPhone. It's easy to integrate on Android. Just follow the instructions. On iPhone it's quite tough. In the Xcode project you need to link additional libraries. The problem with the instructions is that not all libraries you have to link are mentioned. While desperatly searching for an error, I stumbled across following stack overflow answer. You have to add EventKit.framework and EventKitUI.framework to the list. That did the trick. Since then, it's working like a swiss clockwork. Microsoft Ads Plugin - For a limited time the microsoft ads plugin from prime31 is free (until mid of 2015). So catch it if you can. This is so easy to integrate, I can't really believe it. No try-and-error, no google for problem solving, just import the package, configure your app and ad id and you're ready to go. Google Play Leaderboard - if you carefully read the instructions, it's easy to integrate this plugin. Again, for iPhone you need to link some libraries. The bad side for iPhone users is that they have to login with a Google+ account. That's why we haven't integrated the leaderboard on iPhone yet. Another thing is that I found an error while targeting a specific leaderboard. But I could fix it. Long lives open source. The issue should be fixed soon on Github. We have a working alpha with two levels, the basic level and a level where we speed up the numbers and reducing the count of available slots by 1. We are now trying to find the optimal numbers of tracks. In one of next few journals I want to talk about the mathematical and geometrical background of our number figures. The topic is: how can we map the numbers 0-9 to geometrical figures. Especially the number 2 is difficult. But with help from a math professor we solved that, the results are quite impressive (he's a geometry expert and an amazing teacher). So stay tuned and follow us on Twitter or Facebook.